Investors borrowed a record amount to buy stocks last month, an indication of market confidence — or irrational exuberance. Margin debt, or money borrowed to buy shares, hit a record high of $528.2 billion in February, according to data from the New York Stock Exchange. The previous high was $513.3 billion set in January. 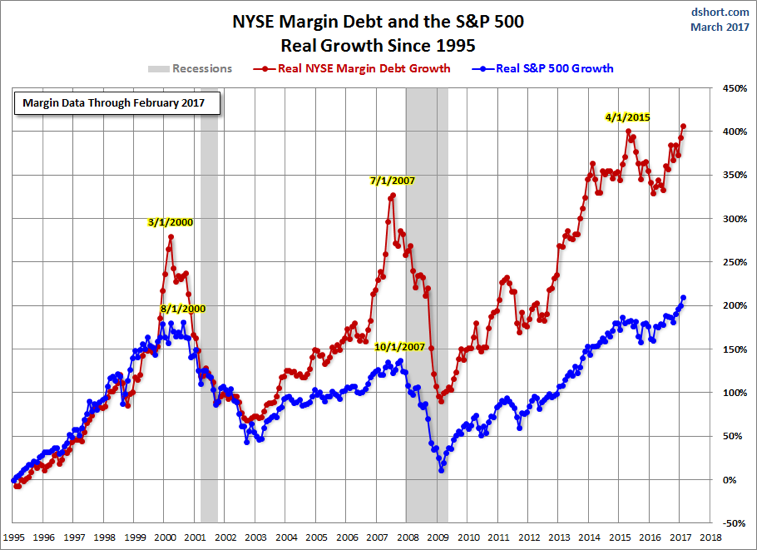 Margin debt typically tracks the broader stock market. Investors usually borrow more when stocks are on the upswing, optimistic that share prices will continue to rise. But a dramatic increase in margin debt can signal that investors are too confident in the market’s upward trajectory and a correction may be on the horizon. Margin debt peaked right before the dot-com crash, jumping 22 percent from the end of 1999 to March 2000, when the stock market crested. It again hit an apex in July 2007, three months before stocks toppled and the financial crisis took hold. Before this year, the last margin debt record was set in April 2015, when the total reached $505 billion. In the following months, margin debt fell back and in August, the stock market swooned, declining more than 10 percent.